ABRAMSON Arthur. Battery HQ on April 15, 1943. ADOMAITIS Alphonse. ASN O-1173523. Battery HQ. 2nd Lt on April 1943. Assigned to Battery B on January 16, 1945. AIELLO Kenneth J. (August 25, 1918 - February 10, 2015) ASN 37521033. Enlisted on March 23, 1943. Battery HQ, Pfc on November 1943. ALDINGER Leroy. ASN 37557960. Enlisted on April 7, 1943. Battery HQ, Pvt at this time, Pfc on March 1945. ALFORD Forest B. Klamath Falls, Oregon. Battery A.
AMMERMAN Edward C. Jersey City, NJ. Battery A.
AMUNDSEN Irving. Brooklyn, NY. Battery A (photo). ANCKER Jack P. Battery HQ. ANGOVE El W. ASN 37637208. Battery HQ? T4. ANGSTEAD Jack D. Battery B.
ARENDT Alfred A. Battery B.
ARONSON Ralph L. ASN 33596004. Enlisted on March 26, 1943. Battery HQ, Pvt at this time. ASHLEY Darwin. Battery A. Pfc. Transferred to Camp Butner, NC (reassignment center) after Tennessee manoeuvers). ASKIN Sidney E. ASN 33719034. Enlisted on April 3, 1943. Battery HQ, Pvt at this time. T4 on March 1945 then reduced to grade of Pvt on April 25, 1945. BABCOCK Orval F (21/12/1916 – 16/02/2011). Kirksville, Adair County, Missouri. Awarded Bronze Star Medal. BALDWIN Troy. ASN 33646984. Private. BAMO Oren. Battery A. Pvt. Transferred to Camp Butner, NC (reassignment center) after Tennessee manoeuvers. BASKET Neil I. ASN 37521127. Enlisted on April 9, 1943. Battery HQ, Pvt at this time. BATES John J. ASN W2166347. Battery HQ. WOJG. Personnel Adjutant. BAUGHMAN Thomas P. ASN 37477863. Assigned to Battery HQ on April 18, 1943. BEITLER John J. ASN 33676784. Enlisted on April 3, 1943. Attached Medical Detachment, Battery HQ (on November 1943), Pvt at this time. BELL James R. Battery A. Pfc. BENDER Edward J. Towson, MD. Battery A.
BENECKE Elmer G. Mapple City, NJ. Battery A.
BERTOTI James. Pottstown, PA. Battery A.
BETCHY Ernest D. Battery A. Pvt. Transferred in other unit while staying in Camp Forrest, circa 1944. BISCOE Benton R. ASN 13177869. Enlisted on March 10, 1943 and transferred to Battery HQ on April 10, 1943, Pvt at this time, Pfc on March 1945. Severely wound in action on March 24, 1945. BLACH John L. ASN 32930548. Enlisted on April 7, 1943 and transferred to Battery HQ on April 18, 1943, Pfc on November 1943. Lightly wound in action on March 24, 1945 (hit by shrapnel). BLAKE Walter L. Battery A. S/Sgt. He was transferred in other unit while staying at Camp Forrest. BLAND William H. Dennison, OH. Battery A.
BLANSETT Marion G Jr. Battery A. Sgt. BLUME Joseph. Cleveland, OH. Battery A. Sgt. BOBOVNIK Sylvester R. ASN 35288493. Sgt when DOW on March 24, 1945. BOOTH Charles E. ASN 33676819. Enlisted on April 3, 1943 and transferred to Battery HQ on April 15, 1943. Cpl or T5 on November 1943 and later S/Sgt. Transferred in the 320th GFAB / 82nd AB Division on July 5, 1945 (and after in the 376th PFAB / 82nd AB Division ?) (photo). BOOTH Kenneth L. Battery A. Pfc. Transferred to Camp Butner, NC (reassignment center) after Tennessee manoeuvers. BORS Albert H. ASN 35058395. Enlisted on April 8, 1943. Transferred on Battery HQ on April 18, 1943, Cpl or T5 on November 1943. BOYKIN Willie B Jr. Seminary, Mississippi. Battery A. T/5. BRANSKI Clement A. ASN 16006557. Battery HQ. S/Sgt on December 21, 1944. BRATEK Matthew J. ASN 33597087. T/5 when KIA on January 8, 1945. BREEN William M. ASN 15307384. Battery HQ. Pvt on May 1944. Promoted Sgt on January 13, 1945. BREWER Crevice D. ASN 37520116. Enlisted on April 2, 1943. Transferred to Battery HQ on April 18, 1943, Pvt at this time. BRIDGE Charles A. Josephine, PA.
BRISACH Joseph C. ASN 33669807. Battery B. Pvt when DOW on April 2, 1945. BROCK Charles H. ASN 332849266. Enlisted on March 23, 1943. Transferred to Battery HQ on April 14, 1943, Pfc on November 1943. BROCK Leroy J. ASN 32849276. Enlisted on April 2 1943. Transferred on Battery HQ on April 14, 1943, Pvt at this time. Promoted T5 on January 13, 1945. BRODEK Steve. Battery A. Transferred to Camp Butner, NC (reassignment center) after Tennessee manoeuvers. BROWN Clifton F. Battery B. BROWN Floyd J. ASN 37520569. Enlisted on April 7, 1943. Attached Medical Detachment, Battery HQ (on November 1943), Pvt at this time. BROWN George. Battery A. Transferred to Camp Butner, NC (reassignment center) after Tennessee manoeuvers. BROWN Roy E Sr. ASN 37521232. Kansas City, Kansas. Battery A. Pvt. BUCKLEY Robert D. Battery B.
BUCKWORTH William W Jr. Battery A. Sgt. BURLETT Francis J. Pittsburg, PA. Battery A.
BURROUGH James H. ASN 35553429. Pvt. BURSTOCK Herbert I. ASN 32898703. Battery HQ. Promoted Pfc on January 16, 1945. BUSCHER Lyle J. Alta, LA. Battery A. Cpl. B UTLER Harold E. ASN 37558230. Enlisted on April 9, 1943. Battery HQ, Pvt at this time. (photo). CAMERON Charles. Philadelphia, PA. Battery A.
CAMPBELL Charles V. ASN 35140639. Pvt when DOW on March 24, 1945. CAMPBELL Dwight L. Shelocta, PA. Battery A.
CAMPBELL George A. Youngston, OH. Battery A.
CAMPBELL Glenn H. ASN 33632046. Battery B. Pfc when DOW on April 3, 1945. CANNON Frederick B. ASN 33631864. Battery A. Cpl when KIA on December 25, 1944. CARISMEN Kenneth. Burbank, CA. Battery A.
CARNEY William J. ASN 32930195. Enlisted on April 3, 1943. Battery HQ. Pvt on November 1943. CARNS Walter B Jr. ASN 34213617. Enlisted on March 3, 1942. Battery HQ. T/Sgt on November 1943. CARSON Leroy V Jr. ASN 33676606. Enlisted on April 2, 1943. Battery HQ. Pvt in November 1943. Promoted Cpl on January 13, 1945. CARTELLI Joseph S. ASN 37478203. Enlisted on April 9, 1943. Battery HQ, Pvt at this time. T5 on March 1945. Hospitalized on March 29, 1945 (non battle casualty). CASCHERA Romeo J. ASN 20302867. CASTEEL James A. ASN 34235349. Enlisted on March 12, 1942. Battery HQ. 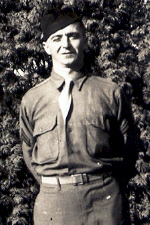 Staff Sergeant on November 1942. CATHEY James C. ASN 34259757. Battery HQ. 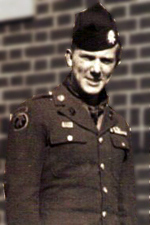 T/Sgt on May 1944, later S/Sgt. CHAPPELL Walter W. Battery A.
CHIARETTI John L. Battery B.
CHILDERS Howard. Steubenville, OH. Battery A. Sgt. CLARK Harless. Battery HQ on April 15, 1943. Pvt. CLARK Harold M. ASN 37520132. Pvt. CLAUSEN Alvin A. Sioux City, IA. ASN 37477947. Battery A. Pvt. COAKLEY Charles E. Battery B.
COLAMIO Nicholas A. Battery A. Pvt. He was transferred in other unit while staying at Camp Forrest. COLAPIETRO Thomas J. Swissvale, PA. Battery A.
CONCA Vincent A. ASN 33597543. Enlisted on April 1, 1943. Battery HQ. Pvt on November 1943. COPP Donald L. Elmira, NY. Battery A. Pfc. CORR Charles J. ASN 35289546. Enlisted on March 25, 1942. Battery HQ. 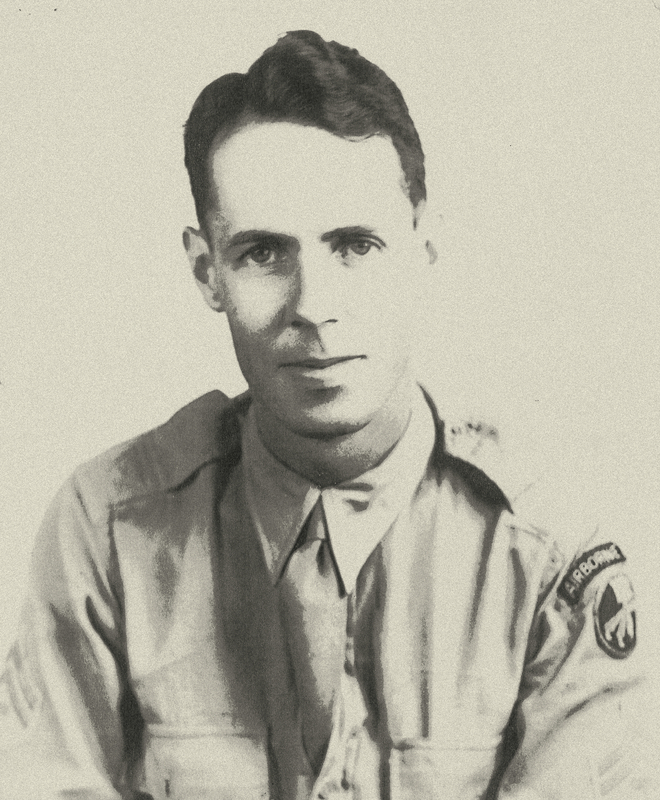 Staff Sergeant on November 1943. COTMAN Frank (23/01/1917). Cleveland, OH. Battery A. Cpl (photo). COWAN William F. ASN O-1178745 (?) Battery HQ. 2nd Lt on April 1943. COX James F Jr. ASN 33676787. Battery HQ. Promoted Cpl on January 13, 1945. COX John T. Raleigh, NC. Battery A. Pfc. COYNE William J. ASN 33621929. Enlisted on March 30, 1943. Battery HQ, Cpl or T5 on November 1943. Lightly wound in action on March 24, 1945 (hit by shrapnel). CRAWFORD Donald T. Battery A. Transferred to Camp Butner, NC (reassignment center) after Tennessee manoeuvers. CRISMAN Kenneth L. Battery A. Sgt. CROCKETT William M. Springfield, MO. Battery A. Cpl. CROTTY John V. ASN 32849380. Enlisted on April 5, 1943. Battery HQ. Pvt on November 1943, T/5 when DOW (shot in back on March 24, 1945) on March 25, 1945. CULLEN Robert J. Battery A. He joined the 680th GFAB at Chiseldon, England. CULLER Paul M. Battery B.
DAHL Rudolph H. Iron Mountain, Michigan. Battery A. T/5. DAVIS Joseph A (13/12/1921 - 14/04/2011). Oakland, CA. He joined the Texas National Guard in May 1940 at Bonham. 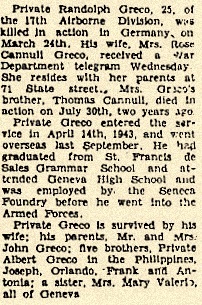 When the Guard mobilized, he became a radio operator and was selected for OCS and in November 1942. Commissioned as a 2nd Lt. at Fort Sill, Okla, he joined the 17th AB Division and was assigned to HQ Battery. On September 18, 1943, Joe married Lora Cotham. They came to Fayetteville, Ark. by train, to Elkins by cab and soon on the Camp Mackall, NC. Joe arrived in Liverpool, England, in August 1944, the day his first child was born. Christmas Eve 1944, the battalion arrived in France to join the Battle of the Bulge. As they left England that day, he became battery commander and later won a battlefield promotion to Captain. Awarded Bronze Star Medal. DAVIS Kestle E. Anexville, Tennessee. Battery A.
DAVIS Vincent P. ASN 33720159. Enlisted on April 8, 1943. Attached Medical Detachment, Battery HQ (on November 1943), Pvt at this time. DECKER Romayne L. Battery A. T/5. Wounding during paratrooper qualification course at Camp Forrest, summer 1944. He never returned in his unit. DE FOREST Owen D. Battery B.
DELL Earl E. Altoona, PA. Battery A. DE MARS James A. Toledo, OH. Battery A. Pfc. DE MERSE Kermit A. ASN 16071724. Enlisted on March 24, 1942. Attached Medical Detachment, Battery HQ (on November 1943). Cpl or T5 at this time. DERBISH John Jr. ASN 6667623. Enlisted on March 25, 1943. Battery HQ, Pvt at this time. DIEROLF Russel K. ASN 33602356. Enlisted on April 5, 1943. Battery HQ. Pvt on November 1943. Promoted Pfc on January 16, 1945. DI NUNZIO Bernard J. ASN 32872970. Battery HQ. T5. He was hospitalized on February 15, 1945 (non battle casualty). DOBSON George R. Battery B.
DONATO Joseph M. Battery B.
DORS Joseph C. Detroit, Michigan. Battery A. DOWNING Charles W. ASN 37611733. Enlisted on April 14, 1943. Attached Medical Detachment, Battery HQ (on November 1943). Pfc at this time. DRINKARD Chester L. Jefferson City, MO. Battery A.
DRUMMELLER W F. Battery B.
DUNALEWICZ Stanley A (1917). Pittsburg, PA.Inducted in the Army on 18/04/1943 at Pittsburg, PA. ASN 33668409. Battery A.
DUNCAN William J. ASN 37521475. Enlisted on April 10, 1943. Battery HQ. Pvt on November 1943, Pfc on February 15, 1945. DZIEDZIC Frank J. ASN 32930520. Battery HQ. Assigned to Battery A on January 16, 1945. Pfc at this time. EAST Clifford E. ASN 35140618. Battery B. Pfc when KIA on March 24, 1945. EDMISTON Robert D. Indiana, PA. Battery A.
EDWARDS Eugene G. Battery B.
EDWARDS Robert. ASN 32839472. Pvt. EDWARDS Vern R. Parma, Idaho. Battery A.
EGLE James J. Battery B.
EIDSVIG Ralph E. Kathryn, N. Dakota. Battery A. ELDER Hoyt. ASN 34084867. Enlisted on July 9, 1941. Battery HQ, T5 on November 1943. ELLIS Arthur. Cleveland Heights, OH. Battery A. T/4. ELSAESSER Harris H. Meherin, VA. Battery A.
ENGLERT Paul F. ASN 35929607. Battery HQ. Pvt in March 1945. ENSLEY Alvis E. Fieldale, VA. Battery A.
ERWIN Laurence S. Phoenixville, PA. Battery A.
EWING Melvin L. Salina, PA. Battery A.
FARNSWORTH Earl B. ASN 32853957. Battery HQ on April 15, 1943. Pvt then Cpl on April 1945. Hospitalized on April 10, 1945 (non battle casualty). FASKO Edward J. ASN 35058330. Pfc when DODY. FEATHERSTON John H J. ASN O-25691. Battery A CO. Capt. When KIA on March 24, 1945. Awarded Silver Star Medal by General Order Headquarters, 17th Airborne Division, General Orders No. 19 (April 15, 1945) : The President of the United States of America, authorized by Act of Congress July 9, 1918, takes pleasure in presenting the Silver Star to Captain (Field Artillery) John Henry Featherston, Jr. (ASN: 0-25691), United States Army, for gallantry in action against the enemy while serving with Battery A, 680th Glider Field Artillery Battalion, 17th Airborne Division near Heiderott, Germany, on 24 March 1945. After landing by glider, Captain Featherston quickly assembled available elements of his battery and moved to the pre-designated position area where his battery came under intense small arms fire from an enemy strong point. Captain Featherston immediately organized an attack, firing on the house with one of his howitzers. He personally led a final assault on the enemy position. His aggressive and gallant action permitted artillery units to gain their positions with a minimum of casualties and deliver immediate supporting fire to the airborne crossing of the Rhine River. FEESE Roger N (15/02/1923 - 05/10/2012). ASN 37478202. Battery HQ. Sgt on January 23, 1945 and hospitalized at this date (non battle casualty). Discharged on January 8, 1946. FELT Harold R. ASN 32849485 Enlisted on April 6, 1943. Battery HQ. Pvt on November 1943. Promoted Pfc on January 16, 1945. FILIPETTI Silvio P. Lackawana, NY. Battery A.
FISHER Meril S. ASN 33506177. Mechanicsburg, PA. Battery A. Pvt. FLEMING Robert E Jr. Oakmont, PA. Battery A.
FLETCHER Earl O. ASN 37518918. Enlisted on March 26, 1943. Battery HQ, Pvt at this time. FLORA Bruce E. Lagro, Indiana. Battery A.
FOGWELL Clayton. Battery A. Pfc. FORSYTHE Francis O. Battery B. FOSTER Lowell E. Omaha, Nebraska. Battery A. T/5. FOX Walter W. ASN 35290275. Enlisted on March 19, 1942. Battery HQ, Sgt or T4 on November 1943. FRANKLIN Kenneth L. Kansas City, MO. Battery A.
FRANSWORTH Earl B. ASN 32853957. Enlisted on March 23, 1943. Battery HQ, Cpl or T5 on November 1943. FREEMAN Max E. Battery A. 2nd Lt. FROST Oscar B. Midlothian, MD. Battery A. Pfc. FULLER Anderson. Battery A. Transferred to Camp Butner, NC (reassignment center) after Tennessee manoeuvers. GALVIN Robert F. ASN 31427619. Pvt on March 1945. GAMBINO Gabriel P. ASN 35058381. Enlisted on April 8, 1943. Battery HQ. Pvt on November 1943. GANNON Asa G. ASN 37520148. Pvt when DOW on January 7, 1945. GARROW Francis. Syracuse, NY. Battery A.
GEIGER Edward H. 1st Lt on April 1943 (Battery HQ), later Captain in Battery A, CO after the death of Captain Featherston on March 24, 1945. GEIMER Emil J. Battery A. Lt.
GENDILL Ernest F. ASN 37344536. Enlisted on April 12, 1943. Battery HQ. Pvt in November 1943. GENTRY ??. Battery HQ ? 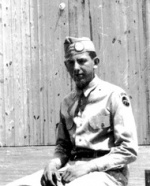 2nd Lt on April 1943. GERVIG Charles M. Battery A. Lt. Wounding in action on January 8, 1945. GIOVINAZZO Alfred (02/12/1924). Memphis, TN. Battery B.
GLOVER Harold C. Battery B.
GOFORTH William F. ASN 37611597. Pvt. GOGAL Thomas. ASN 33622882. Pvt when KIA on March 24, 1945. GOLDBERG Daniel. Battery A. Pfc. GOLDBLATT Marcus. ASN 35110862. Enlisted on March 25, 1942. Battery HQ. 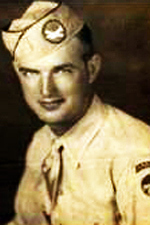 Staff Sergeant on November 1943. GOURLEY Harold C. Battery HQ on April 15, 1943. T/5. GRACE Ralph A. Rising Sun, Indiana. Battery A.
GRECO Randolph R. ASN 32844753. 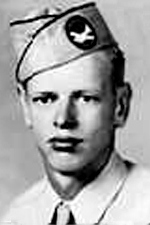 Battery B. Pfc when KIA on March 24, 1945 (press article). GREENWALD Harold B (03/03/1924). Cleveland, OH. ASN 35058091. Inducted in the Army on April 7, 1943 at Camp Perry, OH. Battery HQ. Cpl ot T5 at this time. Battalion mail clerk. Transferred after de VE Day in the 101st AB Division and later in the 82th AB Division. He participated in the Victory Parade in Berlin and then the Victory Parade in New York City on 6 January 1946. Discharged at Indiantown Gap, PA on 16 Jan 1946 (photo). GREER Willie L. ASN 34235353. Enlisted on March 12, 1942. Battery HQ, Staff Sgt on November 1943. GRENFELL Gordon F. ASN O-1165393. Battery HQ. 1st Lt on April 1943, Capt on April 1945. GRETZ Samuel. Atlantic City, NJ. Battery A.
GRIFFIN Daniel E. Battery B. GRILL Joseph P. ASN 15322003. Battery HQ. Pvt on December 1943, Sgt on March 1945. He was lightly wound in action on March 24, 1945 (wounded through upper arm and grazzed along). GROSSMAN Paul. ASN 33599077. Enlisted on April 8, 1943. Battery HQ. Pvt on November 1943. GROTT Gerald J. ASN 37182129. Battery HQ. T5 on April 1945. Hospitalized on April 22, 1945 due to jeep accident (left broken arm). GUDAITIS Joseph M ( - 02/02/1972). ASN 33621892. Enlisted on March 30, 1943. Battery HQ. Pvt on November 1943. Retired in 1961 with the rank of Sr. Master Sgt. He is burried in Marietta National Cemetery, Marietta, GA.
HACKENBURG Lawrence L. Belmont, Kansas. Battery A.
HAINES Louis R. Transferred to Camp Butner, NC (reassignment center) after Tennessee manoeuvers ? HALINSKI John S. Irvington, NJ. Battery A.
HALLADAY Clifford. Battery B. Wounded in action on Fabruary 7, 1945 (photo). HANDRICH Rudolph L. ASN 36239023. Enlisted on March 26, 1942. Battery HQ. T/4. HARDYMAN James R. Blanchardville, Wisconcin. Battery A.
HARNED Daniel R. Mt Vernon, NY. Battery A.
HARRINGTON I B. Mexico, MO. Battery A.
HARRIS Carl. Battery A. Pvt. Transferred to Camp Butner, NC (reassignment center) after Tennessee manoeuvers. HARRIS William. ASN 37344533. Enlisted on April 12, 1943. Battery HQ, Pvt at this time. HASH Carl H. ASN 33720618. Pvt when KIA on March 24, 1945. HATCH Russell E. ASN 35289254. Enlisted on March 23, 1942. Battery HQ, Sgt or T4 on November 1943. HATCHIGIAN Vaskin. Niagara, Falls, NY. Battery A.
HEINERT Martin. Battery A. Pvt. Transferred to Camp Butner, NC (reassignment center) after Tennessee manoeuvers. HELINSKI John S. Battery A.
HENRY Charles S. Battery A ? HENN Raymond H. Battery B.
HENNESSEY Robert G. ASN 37667925. Battery HQ. Pvt on May 1944. HENRY Donald I. Pittsburg, PA. Battery A.
HERST Arthur J. Levittsburg, OH. ASN 35289728. Battery A, transferred on Battery HQ on December 24, 1943, T/4 at this time. HICKEY Maurice F. Rocky River, OH. Battery A (or HQ ?). S/Sgt. HIGGINS Charles S. ASN 32849497. Enlisted on April 6, 1943. Battery HQ, Pvt at this time. HILES Arthur J Jr. Missouri Valley, Iowa. Battery A.
HLACH John L. ASN 32930548. Battery HQ. Pvt on May 1945. Lightly wounded in action on March 24, 1945. HLADIK Yaro J. Battery B.
HOLBROOK Francis. Battery B. 1st Lt. Wounded in action on Fabruary 7, 1945. 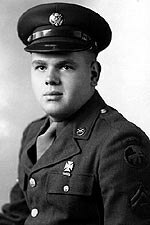 Awarded Silver Star Medal during the Bulge. HOLLAND Browder. Battery A. Pvt. Transferred to Camp Butner, NC (reassignment center) after Tennessee manoeuvers. HOLLE Vernon. Battery A. Cpl. HOLLMAN Francis M. Philadelphia, PA. Battery A.
HOLMES Leroy L. Washington Co, MD. Battery A.
HORN John F. ASN 32844684. Enlisted on April 6, 1943. Battery HQ, Cpl or T5 on November 1943. HUMPHREY Johnnie S Jr. Millen, GA. Battery A.
HURST Arthur J. Battery A. T/4. HYMEL Alvin. ASN 34235979. Battery A. T/4 when KIA on Decembre 25, 1944. IWING Melvin. Battery A. Pfc. JASTREBSKY Victor S. ASN 33632241. Enlisted on April 1, 1943. Battery HQ, Pvt at this time. JESSOP John W. ASN 32931033. Enlisted on April 12, 1943. Battery HQ, Pvt at this time. JOHNSON Earl. Pvt. Transferred to Camp Butner, NC (reassignment center) after Tennessee manoeuvers. JONES James M. Montgomery City, MO. Battery A. Pfc. KALINA William E. Cleveland, OH. Battery A.
KAMINSKI John D (24/06/1923). South Park, OH. Battery B (photo). KANTAK Edward C. Syracuse, NY. Battery A.
KAZOROWSKY Horrome. Battery A. Pvt. Transferred to Camp Butner, NC (reassignment center) after Tennessee manoeuvers. KELLINGTON Thomas C. Battery B.
KELLY Glenn H. Battery A. Transferred to Camp Butner, NC (reassignment center) after Tennessee manoeuvers. KINCAIDE Doyal. ASN 35140628. Battery A. Pvt when KIA on December 1944. KING Luther J Jr. ASN 37611501. Enlisted on April 12, 1943. Battery HQ, Cpl or T5 on November 1943. KIRBY Clayton L. Arlington, VA. Battery A. Pfc. KIRCHNER Frank J. Milwaukee, Wisconsin. Battery A. Sgt. KOBLINSKI John J. ASN 36396546. Enlisted on March 23, 1942. Battery HQ, Sgt or T4 on November 1943. KOVAL Peter. ASN 32476055. Enlisted on September 12, 1943. Battery HQ, Cpl or T5 on November 1943. Reduced to grade of Pvt on April 1945. KRANTZ Robert H. Battery A. He joined the 680th GFAB at Chiseldon, England. Wounding in action on January 7, 1945. KRASKA Henry S. Battery B.
KRUELLE Mathias H. Battery B.
KUBANKA Ernest V (1919). Rochester, NY. Battery A.
KUDLA Frank J. ASN 16001860. Battery A. 1st Sgt. KUHN Henry. Cumberland, MD. Battery A.
LAFAVERS Alph A. ASN 35701289. Battery A. Pvt when KIA on December 25, 1944. LAMB Luther H. Senath, MO. Battery A.
LANKFORD Charles H. ASN 6967057. Enlisted on February 25, 1942. Battery HQ. T/Sgt when KIA on December 25, 1944. LARSON Jack B. ASN O-1180237. Battery HQ. 2nd Lt. Assigned to Battery B on January 19, 1945 then returned to Battery HQ for Varsity. Lightly wound in action on March 24, 1945 (wounded under the chin and leg). LAWRENCE Harry G Jr. ASN 15339536. Battery HQ. Pvt on December 21, 1944. LAY Alva R. ASN 35701306. Pfc when KIA on April 3, 1945. LEACH Max. Battery A. Pfc. Transferred in other unit while staying in Camp Forrest, circa 1944. LEATHERMAN Joseph E. ASN 37522766. Enlisted on April 16, 1943. Battery HQ, Pvt at this time. LEONHART Edward. Battery A. Pvt. Transferred to Camp Butner, NC (reassignment center) after Tennessee manoeuvers. LEWIN James E. Covington, Indiana. Battery A.
LEYDIG Carl H (08/05/1918). Ellerslic, MD. Battery A.
LILES Thomas F. Fomewood, Alabama. Battery A.
LOLL Edwin. Battery A. Lt. Wounded in action on January 7, 1945. LONG Arlan W. Macungie, PA. Battery A. Cpl. LONG Herbert L. ASN 33738523. Enlisted on March 31, 1943. Battery HQ, Pvt at this time. LUNALOWICZ Stanley. Battery A. Pfc. MADDEN Harold V (10/04/1924 – 12/07/2009). Jackson County, Minnesota. Battery A. Inducted in the Army on April of 1943 in Jackson County. Transferred in the 82nd AB Division – 456th PFAB after VE Day. He was selected to carry the guidon for Battery C - 456 PFAB during the New York City Victory Parade on January 12, 1946 (photo). MAGLISH John M. Battery B.
MAGNER Thomas F. ASN O-1177067 (08/10/1918). Buffalo, NY. Battery B. 1st Lt. then Captain, CO.
MAJEWSKI Stanley. ASN 3632635. Cpl. MALECKAR Joseph R. Cleveland, OH. Battery A. S/Sgt. MALEY James J. ASN 35288967. Enlisted on March 19, 1942. Battery HQ. T/Sgt on November 1943. MALIK John J. Battery B.
MANCINI Harry J. ASN 32135982. Pvt when KIA on March 24, 1945. MANLEY Melvin C Jr (29/09/1923 – 05/06/2009). Sixmilerun, PA. Battery HQ on April 15, 1943, Pvt at this time. Later transferred to Battery B.
MANTEUFEL William. Watsonville, CA. Battery A. He joined the 680th GFAB at Chiseldon, England. MARCANTONIO Patsy. Cannonsburg, PA. Battery A.
MARCINIAK Thomas R. Buffalo, NY. Battery A.
MARINO Anthony A. Philadelphia, PA. Battery A.
MARSHALL Earl C. ASN 35450050. Enlisted on March 30, 1942. Attached Medical Detachment, Battery HQ on November 1943. Staff Sgt at this time. MARTINEZ Sylvester R. Mason City, Iowa. Battery A.
MATUSZEWSKI Aloysius. ASN 32844595. Enlisted on April 5, 1943. Attached Medical Detachment, Battery HQ (on November 1943), Pvt at this time. MAURER Robert O. ASN O-1177074. Battery HQ. 2nd Lt promoted 1st Lt on February 1, 1945. MAXEY John B. Battery A. Lt.
MAYER David L. Dayton, OH. Battery A. He joined the 680th GFAB at Chiseldon, England. MAYS Cecil. Hermandale, MO. Battery A.
McDOWELL Astel G. ASN 37522741. Enlisted on April 16, 1943. Battery HQ, Pvt at this time. McFARLAND Allen R. ASN O-1130364. Battery A. 2nd Lt.
McGLOCKLIN William G. Glade Spring, VA. Battery A.
McLAUGHLIN Milton E. ASN 37558097. Enlisted on April 9, 1943. Battery HQ, Pvt at this time. McNEILL James F. ASN 37668684. Enlisted on April 13, 1943. Attached Medical Detachment, Battery HQ (on November 1943), Pvt at this time. MEEK George. Battery A. Pfc. Transferred to Camp Butner, NC (reassignment center) during Camp Forrest circa. MEISSNER Carl R. ASN 32930128. Battery HQ on April 15, 1943. Pvt promoted Cpl on September 1943. MELSON Harold O. ASN 37478169. Enlisted on April 9, 1943. Battery HQ, Pvt at this time. MEPHAM Walter E. ASN 32844736. Enlisted on April 7, 1943. Battery HQ, Pvt at this time. MEROLLA Olimpio R. ASN 35289894. Enlisted on March 25, 1942. Battery HQ. First Sgt on November 1943. MESSNER Carl R. ASN 32930128. Battery HQ. Enlisted on April 2, 1943. Battery HQ, Cpl on March 1945. MEYER Carl. Waterloo, NY. Battery A. T/5. MEYER James B. ASN 35135346. Enlisted on March 20, 1943. Battery HQ, Cpl or T5 on November 1943. MILLER Albert L. Cleveland, Ohio. Battery A.
MILLER Kenneth C. ASN 32848491. Enlisted on March 22, 1943. Attached Medical Detachment, Battery HQ (on November 1943). Pfc at this time. MILLER Peter A. Tullytown, PA. Battery A. Pfc. MINNEAR Ruppert. ASN 34729081. Pfc when KIA on March 24, 1945. MISZLER Vincent E. Battery A.
MITCHELL Dale W. Abingdon, VA. Battery A.
MOE Clarence R. ASN 37558344. Enlisted on April 10, 1943. Battery HQ, Pvt at this time. MOORE Lohnie O. Van Buren, Arkansas. Battery A.
MOORE Martin H. Kenmore lu, NY. MOORE Maurice S. Columbia, S. Carolina. Battery A.
MORRIS Dale H. Urbana, Indiana. Battery A. Sgt. MUELLER Miron C. Battery B.
MUNDIE William F. ASN 33718977. Enlisted on April 3, 1943. Battery HQ. Pvt in November 1943. MUNRO Robert J. ASN 37558146. Enlisted on April 9, 1943. Battery HQ, Pvt at this time. Promoted Pfc on January 16, 1945. He was lightly wounded in action on March 24, 1945 (wounded in both legs, right one broken). MURRAY John J. Battery B.
NANKOFF Daniel Jr. Battery HQ on April 15, 1943. Pvt. NELSON Harold O. ASN 37478169. Battery HQ. Pvt on April 1944. NEVIUS Edwin M. ASN O-1185108. NICKELSON Albert J Jr. St. Louis, MO. Battery A.
NIEBEL Louis J. Battery B.
NOLL Edwin F. Battery B. Lt.
NOYES Harry W. Battery A. He joined the 680th GFAB at Chiseldon, England. O'BRIEN Richard E. ASN 42098655. Affected to Battery HQ on April 3, 1945. Pvt at this time. ODOM Frank H. Granite City, Illinois. Battery A.
OSSMAN Paul B. Ashland, PA. Battery A.
OSWALD Paul F (11/11/1913). Delaware City, DE. Battery HQ. Lt Col. Battalion CO (photo). OWENS Price E. Clintwood, VA. Battery A.
OWENS Richard L. Oakdale, PA. Battery A. Pfc. OWREN Selmer O. Sioux Falls, S. Dakota. Battery A.
PALMER Charles L. Dexter, NY. Battery A.
PALMQUIST Lewis E. ASN 37661574. Pfc when KIA on March 24, 1945. PARISI Arigo H. ASN 32471478. Enlisted on September 7, 1942. Battery HQ, Sgt or T4 on November 1943. PARKER James C. ASN 34099720. Enlisted on January 7, 1942. Battery HQ, Pvt at this time. LIA battle casualty on April 7, 1945 at Bottrop, Germany. PARROTT Lynn L. Atlantic, IA. Battery A.
PASNIKOWSKI Chester. ASN 32849250. Enlisted on April 2, 1943. Battery HQ, Pvt at this time. PATNODE Daniel C. Battery B. Wounded in action on Fabruary 7, 1945. PAYNE Joe T. ASN O-1168022. Battery HQ. 2nd Lt on April 1943, 1st Lt on August 30, 1944. Later Captain. PESTER Lloyd V. Battery B.
PETE Albert A. Cambridge, MD. Battery A.
PICHLER Gayle F. Grand Island, Nebraska. ASN 37477463. Enlisted on March 27, 1943. Cpl or T5 on November 1943. Battery HQ, he was transferred on Battery A while he was at Chiseldon, England. PIOSVIG Ralph. Battery A. Sgt. POLKALICKY Eugene M. ASN 35058378. Enlisted on April 8, 1943 and transferred to the Battalion HQ, 680th GFAB on November 23, 1943. T5 when transferred. POOLE Frank H. Battery A. 2nd Lt.
PORAMBO John J. Battery B.
PRIBYL Adrian F. ASN 37558169. Enlisted on April 9, 1943. Battery HQ, Pvt at this time. Promoted T4 on January 13, 1945. PRICE Charles E. Battery B. Lt.
PRONK Nick (06/05/1924). ASN 37558175. Enlisted on April 9, 1943. Battery HQ, Pvt at this time. Promoted Pfc on January 16, 1945. PROPP Harold L. ASN 37344221. Enlisted on April 5, 1943. Battery HQ. Cpl or T5 on November 1943, he was demoted to Pvt on February 7, 1945. Pvt when KIA on March 24, 1945. RAHN Richard E. St. Petersburg, Florida. Battery A.
RAMFJORD Miles O. ASN 37558118. Enlisted on April 9, 1943. Battery HQ, Pvt at this time, T5 on March 1945. He was lightly wounded in action on March 24, 1945 but not evacuated. RANKIN Richard M. Battery B.
RAYNOR Robert D. Battery HQ. REBER Chester E (07/01/1914 - 28/11/1966). ASN 39377485. Enlisted on March 24, 1941. Battery HQ, Sgt. REESE Earl S. ASN 33507129. Enlisted on April 12, 1943. Attached Medical Detachment, Battery HQ (on November 1943), Pvt at this time. REESE Jack ASN O-1177603. Battery HQ. 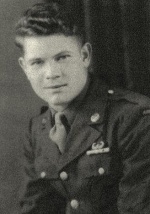 1st Lt on April 1945. REEVES Edward E. ASN 37521516. Enlisted on April 10, 1943. Battery HQ, Pvt at this time. REGIS Ivan L. ASN 32930541. Enlisted on April 7, 1943. Battery HQ, Pvt at this time. RHOADES Lawrence F. Miami, Oklahoma. Battery A. RICE James A. Fredericktown, MO. ASN 33720539. Battery A. Cpl. RICHARDS Harold A. Lansing, Michigan. Battery A. He joined the 680th GFAB at Chiseldon, England. RICKERT Wendell R. Buffalo, NY. Battery A. Wounding in action on January 7, 1945. RINEFIERD William H. Battery B.
RIZZO Carl J. Battery B ( - 30/05/2008) (photo). ROBERTSON Curtis E. ASN 38347493. Battery A. He joined the 680th GFAB at Chiseldon, England. Pvt when KIA on March 24, 1945. ROBERTSON Robert T. Caldwell, Idaho. Battery A.
ROBINSON Harold S. Ceredox, W. Virginia. Battery A. T/4. 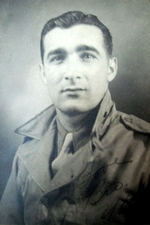 ROCCI Joseph V. Philadelphia, PA. ASN 3596938. Battery A. Pvt. ROCK Michael. Battery B (photo). ROCKAS Tino J. Battery A. T/5. Wounding during paratrooper qualification course at Camp Forrest, summer 1944. He never returned in his unit. ROCKMAN Robert J. Battery HQ on April 15, 1943. Sgt. RODRIGUEZ Joseph J. Hellertown, PA. ASN 33621817. Battery A. Pfc. ROSIER Stewart N Jr. York, PA. Battery A.
R OTH Rhinhardt L. Bloomsdale, MO. Battery A. Pfc (photo). ROWLEY Carl E. ASN 33718984. Enlisted on April 3, 1943. Battery HQ, Sgt or T4 on November 1943. RUCKMAN Robert J Jr. ASN 35290472. Enlisted on March 20, 1942. Battery HQ, Sgt or T4 on November 1943. RUDLA Frank. Battery A. 1st Sgt. He was transferred in other unit during Camp Forrest circa. RUFFINI James V. ASN 33669376. Enlisted on March 31, 1943. Battery HQ, Pvt at this time. RUNDALL John R. Cedar Rapids, Iowa. Battery A.
RUSSELL Alexander. ASN 35450165. Enlisted on March 31, 1942. Attached Medical Detachment, Battery HQ (on November 1943). Cpl or T5 at this time. SABO George H. ASN 39618179. Battery HQ. Promoted Pfc on January 16, 1945. SANDISON George P. ASN 35135645. Cleveland, OH. Enlisted on March 23, 1942. Battery HQ on November 1943, , T4 at the end of the war. 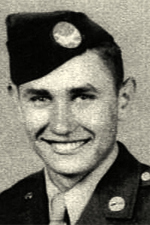 Later transferred to Battery A.
SANDLIN Willard J (22/07/1924 – 17/02/2009). Crosstown, MO. Battery A.
SAWYER Desmond W. ASN 32844635. Enlisted on April 5, 1943. Battery HQ, Pvt at this time, promoted T/5 on September 1943. SCHELLHASE Ray E. Battery B ( - 12/12/2012). SCHMIDT Lawrence H. ASN 33425920. Battery HQ. 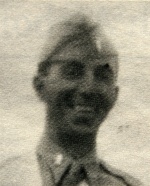 Cpl on March 1945. SCHOEPF Charles J. ASN 15101031. Battery A. Sgt when KIA on March 24, 1943. SCHULTZ Isadore. ASN 37521718. Enlisted on April 12, 1943. Battery HQ, Pvt at this time. SCHWARTZ Barney B. Battery HQ on April 15, 1943. Pvt. SCOTT Thomas A. Battery B.
SEITZ James A. ASN 32930578. Enlisted on April 7, 1943. Battery HQ, Pvt at this time. SELISKER Philip W. ASN 37558231. Enlisted on April 9, 1943. Battery HQ, Pvt at this time. SHEAFFER James A. ASN 13178355. Enlisted on February 4, 1943. Battery HQ, Sgt or T4 on November 1943. SHEPARD Robert L. ASN 38232196. Battery HQ. Pvt on March 24, 1945. He was lightly wound in action on March 24, 1945. SIEBERT George. Battery A. KLD in the end of 1943. SILBER Joseph W. Olasown, MD. ASN 33720317. Enlisted on April 9, 1943. Attached Medical Detachment, Battery HQ (on November 1943), Pfc at this time. He was later transferred to Battery A (during the Bulge). SIMMONS Gordon E. ASN 37478230. Cpl when KIA on March 24, 1945. SMITH James E. ASN 335135525. Enlisted on March 23, 1942. Battery HQ, Staff Sgt on November 1943. SMITH Jess W. ASN 6269357. Enlisted on October 20, 1938. Battery HQ. T/Sgt on November 1943. SMITH John H. Fayetteville, TN. Battery A. T/4. SMITH Tom J. Hamilton, OH. Battery A. S/Sgt. SNYDER James H. Verona, PA. Battery A.
SPRUNK William H. Battery B.
STAHL Jacob I. ASN O-1165452. 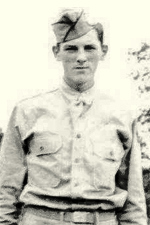 Battry B CO. Capt when KIA on March 24, 1945. STARCK Ronald H. West Allis, Wisconsin. Battery A.
STECKMEYER Gerald T. ASN 37478616. Pvt when DOW on March 24, 1945. STEELE Paul W. ASN 35044776. Enlisted on March 23, 1942 and transferred to the Battery HQ, 680th GFAB on November 30, 1943. Pvt at this time. Hospitalized on January 21, 1945 (non battle casualty). STEELE Roy B. Mississippi. Battery A.
STEIN Charles E. Abingdon, MD. Battery A.
STEIN Morris M. Battery HQ on April 15, 1943. Pvt. STEPCHUK Steven. ASN 33602306. Enlisted on Marc 30, 1943. Battery HQ, Pvt at this time. Promoted Pfc on January 16, 1945. STEWART Lester Q. Captain, Battalion Surgeon. STEWART Paul P. Battery B.
STIEFLER Raymond J. Blesdell, NY. Battery A.
STINCHCOMB Charles R. ASN 33719159. Enlisted on April 3, 1943. Battery HQ, Cpl or T5 on November 1943 (photo). He was demoted to Pvt on February 7, 1945. St JOHN Robert C. ASN 33602306. Enlisted on March 30, 1943. Battery HQ, Pvt at this time. STOLTZ David P. Buechel, Kentucky. Battery A.
SWARTZ Frederick . Battery A. Wounding in action on January 7, 1945. SZEWCZUK Roman R Jr. McKees Rocks, PA. Battery A.
SZIRAK Stephen. ASN 6885092. Battery HQ. Pvt on March 24, 1945. SZORTYKA Henry S. ASN 36817839. Battery HQ. Promoted Pfc on January 16, 1945. TAPPE Robert W. ASN 33677930. Battery B.Cpl when KIA on March 24, 1945. TAYLOR James E. Huntsville, Alabama. Battery A. 1st Sgt. TAYLOR Wade H. ASN 6887308. Enlisted on October 5, 1940. Battery HQ. M/Sgt on November 1943. TERESI August C. ASN 33670351. Battery A. Pvt when KIA on December 25, 1944. THOMAS Warren O. Cinncinati, OH. Battery A. He joined the 680th GFAB at Chiseldon, England. THOMPSON John C. ASN O-1180365. Battery HQ. 2nd Lt on November 1943. THORPE Linwood Jr. ASN 33719409. Pvt. TICKLE William A. Battery B.
TIEDE Roland V. ASN O-40521 (?). Battery HQ. Major on April 1943. TIERNEY Robert C. ASN 37521468. Enlisted on April 10, 1943. Battery HQ, Pvt at this time. TILLMAN Floyd G (02/10/1922). Pen Yan, NY. Battery HQ. Sgt. TORREYSON Lawrence. Battery A. Pfc. Transferred in other unit while staying in Camp Forrest, circa 1944. TROUTMAN Edwin L. Hundman, PA. Battery A.
TUBBY Rufus. Philadelphia, Miss. Battery A. He joined the 680th GFAB at Chiseldon, England. TUTTLE Seymour H. Battery B.
UCEN Robert. ASN 37477867. Battery B. Pfc on June 1944. UNSDERFER William H. Battery HQ ? Captain on April 15, 1943. VALENZANO Louis J. ASN 33718386. Enlisted on March 31, 1943. Battery HQ, Cpl or T5 on November 1943. VANDOMARK Billy J. Saranac, Michigan. Battery A. He joined the 680th GFAB at Chiseldon, England. VAN MESSE John. Detroit, Michigan. Battery A. VAN NESTE John M. Battery A. T/5. VAN WICKLE Harry L. Phelps, NJ. Battery A.
VAUGHAN Joseph W. ASN 37521536. Enlisted on April 10, 1943. Battery HQ, Pvt at this time. Promoted Pfc on January 16, 1945. VALENTINE Earl R. Meyersdale, PA. Battery A.
VALENZANO Louis J. ASN 33718786. Battery HQ on April 15, 1943. Pvt. VENTURA John. Battery A. He joined the 680th GFAB at Chiseldon, England. VERHEYEN Lawrence. West De Père, Wisconcin. Battery A. Pfc. Medic. VISOCKAS Louis W. Wooster, Mass. Battery A.
VITALI Albert J. ASN 33596882. Enlisted on March 30, 1943. Battery HQ, Cpl or T5 on November 1943. He was hospitalized on January on January 27, 1945. WALENCE Francis W. Pennsylvania. Battery A. He joined the 680th GFAB at Chiseldon, England. WALL John E. ASN 33678026. Enlisted on April 10, 1943. Battery HQ, Pvt at this time. WALLACE George A. Battery HQ. WANSING Victor B. Westphalia, MO. Battery A. Pfc. WARD Claude L. Battery A. T/5. Wounding during paratrooper qualification course at Camp Forrest, summer 1944. He never returned in his unit. WASIELEWSKI Edmund J. Buffalo, NY. Battery A. Pfc. WATKINS Seth. Battery A. S/Sgt. He was transferred in other unit while staying at Camp Forrest. WATSON Arlin J. Mt Airy, N. Carolina. Battery A. He joined the 680th GFAB at Chiseldon, England. WEBBER Charles J. Salem. Illinois. Battery A. He joined the 680th GFAB at Chiseldon, England. WEBER Lester T. Battery B. WEEKS SOMERS H. ASN 32750149. Battery HQ. Pvt on December 21, 1944. WELDO? John J. ASN O-1185156. 2nd Lt.
WELLINGTON George D. Battery B.
WELSCH Paul L. ASN 35288147. Enlisted on March 14, 1942. Battery HQ, Sgt or T4 on November 1943. Promoted T/Sgt on January 13, 1945. WESEMAN Elmer B. Battery B.
WESTBY Arthur H. ASN 39211834. Pfc when KIA on March 24, 1945. WHITMORE Harold E. ASN 33632114. Enlisted on April 1, 1943. Battery HQ, Pvt at this time. Promoted Pfc on January 16, 1945. WHITTEN Daniel W. ASN 335291558. Enlisted on March 26, 1942. Battery HQ, Staff Sgt on November 1943 S/Sgt on March 24, 1945. WIGHT George C. Battery A. Capt. Wounding in action on January 7, 1945. 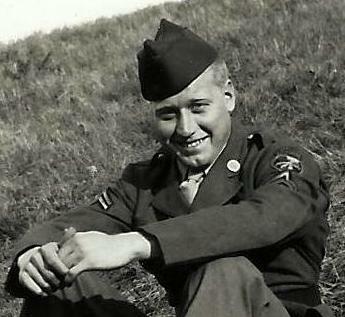 Awarded Silver Star Medal during the Bulge. WIGRE Robert D. ASN 19016143. Battery HQ. Promoted Pfc on January 16, 1945. Hospitalized on April 25, 1945 (non battle casualty). WILD John W. Chicago, Illinois. Battery A.
WILES Alton C. Hayti, MO. Battery A.
WILLIAMS Thomas H. ASN 37521479. Enlisted on April 10, 1943. Battery HQ on November 1943, Pvt at this time. Later transferred to Battery A. Pvt when KIA on December 25, 1944. WILLIS Orval A. American Fork, Utah. ASN 39923545. Battery A (then Battery HQ in April 1, 1945). WILSON Allen E. ASN 36220220. Enlisted on March 23, 1942. Battery HQ. T/Sgt on November 1943. WOJTOWICZ Joseph. Warren, Ohio. ASN 35929428. Battery A (then Battery HQ in April 1, 1945). Pvt in March 1945. WOLF Bernard M. ASN 37520522. Battery B. Pvt. WOLF Neil F. Battery A. T/5. WOOD Homer J. ASN 37344495. Enlisted on April 12, 1943. Battery HQ, Pvt at this time. WOODS Louis C. Rolla, MO. Battery A.
YAEGY William. Battery A. Transferred to Camp Butner, NC (reassignment center) after Tennessee manoeuvers. YORK Dantes A. Battery HQ ? Captain promoted Major on April 16, 1943. YOUNG Robert A. Buzzard Bay, Mass. Battery A. He joined the 680th GFAB at Chiseldon, England. ZAJDEL Frederick J. ASN 32930115. Enlisted on April 2, 1943. Battery HQ, Pvt at this time. ZERWAS John E. St. Paul, Minnesota. Battery A.
ZIBLEY Orlyn D. ASN 37557655. Enlisted on April 7, 1943. Battery HQ, Pvt at this time. 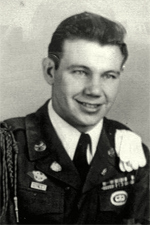 ZIMMERMAN Albert C (07/04/1919 – 31/03/2009). Marathon County, WI. Battery A. 1st Lt (photo). ZIPP Wilbur E. Shawnee, Kansas. ASN 37747276. Battery A (then Battery HQ on April 1, 1945). Pvt on March 1945.